Since it’s Christmas this week, there is only really one appropriate topic. In the church, our children are taught a Christmas song called “Picture a Christmas." The song invites listeners and singers to imagine the events of the Nativity in order to make the Christmas celebration more meaningful. And this is what I would like to do in this week’s discussion. Therefore, I will start at the very beginning. This is, after all, as Julie Andrews teaches us, a very good place to start. The coming of Christ was prophesied from the beginning of human existence, or even before. Our limited records of the Counsel in Heaven teach us that the sending of a Savior was always part of the Lord’s plan. As such, it is fitting that the first prophesy of the Savior occurred in the Garden of Eden. Looking at the story, we see that as soon as Adam had fallen, God made him aware of his fallen state but immediately promised a Savior. Continuing through time, we see records that all of the ancient prophets knew of and looked forward to the coming of their Savior. When Abraham sought greater light and knowledge, he was allowed to learn through his own sacrifices of the sacrifice God would himself make. We see manifold prophesies in the various histories, some clear and some less-so. Ancient prophets in both the Old world and on the American continent knew clearly that Christ would come. The best known prophesy, perhaps, is the one provided to Isaiah. When King Ahaz wondered if the Lord would deliver his army, the Lord offered him a sign by giving to Isaiah the words: "Behold a virgin shall conceive and bear a son (7:14)…For unto us a child is born, unto us a son is given, and the government shall be on his shoulder and his name shall be called Wonderful, Counselor, the mighty God, the Everlasting Father, the Prince of Peace.” (9:6). The coming of Christ was promised as the ultimate sign of deliverance. We could go through many ancient prophesies. By doing so, we would learn that Christ was to be the Son of God, the Lamb who was Slain, the Lord who gathereth the Outcasts, the Bridegroom, the Chief Cornerstone, the Second Moses, the Nail in the Sure Place. We learned that he would come in triumph to the Mount of Olives to deliver his people from their enemies. No heathen would be able to abide the great and terrible day of his coming. Armed with this knowledge and prophesy, let us fast forward to the event itself. You may be familiar with the scenes and the characters. I have long been a believer in the practice of likening the scriptures unto ourselves. This allows us to see specifics where there had hitherto been only generalities. Particularly where a story is so well know, as in the case of the Nativity, likening the characters involved to ourselves allows us to see lessons we may otherwise have missed. For a moment, then, allow me to speak in a more free-form manner than usual. I may not cite the scriptures as frequently as I am wont to, but I want this discussion to be more lively. The first character of Christmas is not Joseph or Mary, but rather Zacharias. While his role in the Nativity itself is not of any significance, he is nonetheless presented by the Evangelists as the first major figure. So what do we know about Zacharias? We know that he was both a Levite and an Aaronic priest. While priests were by no means uncommon in this period, this does nonetheless set Zacharias apart from the House of Judah Jews at Jerusalem. For while they may have controlled the religion of the day, the Aaronic priests held their office not by learning but by birthright. We also know that Zacharias was a righteous, faithful servant of the Lord. In those days, the priestly offices were dealt out by lot. So the fact that we see Zacharias in the act of burning incense is extremely significant. The “course” of Abia had approximately 2 weeks of service in the temple per year, and with approximately 1,000 priests, being chosen to burn incense in the temple was a singular experience, probably something that happened just once in a lifetime. Also, since Zacharias was older, this was probably one of the last times he would ever be eligible to perform any priestly duties. Which leads us to another significant point about Zacharias: he had no children. In those days, this would have been looked upon as some sort of sin or punishment. Instead of bemoaning his fate, he gets to work performing his duties. Let us pause for a moment and consider what incense represents in the temple ceremony. In old testament symbology, the fragrant smoke was thought to carry the prayers of the faithful up to God. So imagine the scene – the congregation of Israel is outside in the temple courtyard praying. At the moment of their prayers, Zacharias was to enter the Holy Place and burn the incense. And at that moment, Zacharias pauses to utter a sincere prayer to the Lord for a child. And then, he turns around and receives a remarkable visitation from Gabriel (Noah). We see from Gabriel’s words “Thy prayer is heard” that Zacharias had been praying for the Lord for a son. We also see from Zacharias’s reaction that the true meaning of prayer had not yet sunk in – while he clearly believed, he never expected an answer. Note that his question is often chided as asking for a sign. However, a subtext (considering his mentioning his wife) could be asking if he is supposed to divorce his wife or take a concubine, practices which were well-known in ancient days. We see similar practices among the patriarchs, for example. Anyway, to wrap up the story, we see that even though he had his doubts, without being graphic, he went home and did what was necessary to enable the fulfillment of the prophecy. We see that it is not until after Zacharias goes home that Elisabeth conceives. I want to dwell on this point for a moment. Up until this point, nothing has changed. If Zacharias had persisted in doubts, he could have stayed in Jerusalem, or could have refused to try to have a child, and he would not have received the blessing. The story of Zacharias contains an oft-overlooked principle: just because God promises something, we still have to do our part to receive it. As the Lord said to the prophet Joseph Smith: “I command and men obey not; I revoke and the receive not the blessing. Then they say in their hearts: this is not the work of the Lord, for his promises are not fulfilled.” (D&C 58:32) Zacharias, on the other hand, despite the impossible nature of the blessing he was promised, despite his doubts, decided to give the Lord a chance to fulfill his promises. So who is Zacharias in the Living Nativity? He represents the man who, despite his doubts, and despite years of seemingly unfulfilled promises, nonetheless magnifies his calling and does his own part to find Christ. The second character of Christmas is Elisabeth, the wife of Zacharias. As we mentioned, the curse of barrenness was severe among the Jews, as it has been among many other cultures as well. Elisabeth is "well-stricken in years” meaning she is long past the time of childbirth. One interesting and oft-overlooked element of the story is that, by the time Zacharias knows about the promise of the baby, he is unable to tell his wife. We don’t know if she could read, so we aren’t sure if he wrote it to her. All she knew was that her husband returned home, mute and unable to communicate with her. And then one day, strange, unexpected changes began to happen in her body. Since she was obviously well-past menopause (some speculate she may have been in her 70s or 80s), there was no telltale sign of her pregnancy. She must have been terrified at the shocking changes in her body, and in this time of trial, the one man she should have been able to turn to was unable to succor her. Clearly, as a righteous covenant daughter of Abraham, she knew the story of Sarah and Isaac. The parallels must not have been lost on her. In fact, after figuring out what was happening, she had the unique chance to identify with a heroine of the scriptures as she went through something only a select few woman have ever experienced. I believe she found comfort in the words of the prophets at a time when she is denied the consolation and support of her husband. So who is Elisabeth in the Living Nativity? Elisabeth represents the faithful member who goes alone through a trial, but remains faithful finding comfort in the scriptures to replace the comfort denied her by society. And when she does have an interaction with the Lord, she rejoices. The next in a series of impossibles is, of course, the Virgin Mary. So who is Mary in the Living Nativity? Mary represents a faithful saint who is called upon to do the seemingly impossible to find Christ (or bring others to him). Yet her faith takes her through without doubt or wavering. Her words are significant "My soul doth magnify the Lord.” (Luke 1:46) She represents a faithful person who finds herself in a position she never requested, expected, or hoped for, but who nevertheless remains faithful. Joseph, of course, represents a very different side of the same coin. We do not know much about him, and aside from his role in the birth of Christ, he is a minor character in the scriptures. All we really know is, one day he comes to visit Mary and finds her pregnant. Many times tradition tells us that they were merely engaged, but the words of Matthew (and the fact that they traveled to Bethlehem together) indicate that they were married at the birth of Christ. Either way, he finds his new wife is pregnant, and he is pretty sure he isn’t the cause. His first thought is, he will divorce her privately, rather than making a public example of her. In his mind (as in the minds of all others), there is no doubt about what has happened. Imagine, for just a minute, that you are in the same situation. This must have been devastating for him. One day he is getting married to a woman he obviously loved, and the next, he finds her pregnant with someone else’s baby. We see, of course, that he also receives a witness. I like to believe that when Matthew writes “while he thought on these things” what he means is that Joseph embarked on a course of serious prayer and pondering. And despite all the evidence to the contrary, Joseph reached the truth and rises to the occasion. So who is Joseph in the Living Nativity? Joseph represents a saint who remains faithful despite impossible odds and what seems like a complete ruination of his own plans. He represents a man who is so overcome in the virtue of patience that he is able to see what others miss and receive revelations that, inevitably, lead him to Christ. Next we have a cast of nameless shepherds. Relatively unremarkable people, they just happened to be sitting out in the field, doing their job, when all of a sudden an angel (probably Gabriel, as this seems to have been his calling) who announces to them (and them only) the birth of Christ. Afterwards, a multitude of angels shows up. Imagine yourself a shepherd that day! What a story you would have had to tell. The only remarkable thing about them, though, is their response to this summons. Not surprisingly, they say “Let us now go even unto Bethlehem, and see this thing which is come to pass which the Lord hath made known unto us.” (Luke 2:15) The scriptures report that they went down with haste. So who are the Shepherds in the Living Nativity? Clearly, the shepherds represent most of us: people who through no great virtue of their own, are blessed enough to have the gospel preached to them. Hopefully, like the shepherds, we will also rush to find Christ as soon as we have the opportunity. All throughout the story, we see the presence and ministering of angels. Specifically, we see Gabriel making surprising pregnancy announcements. We also see a number of angels announcing the birth of Christ. We don’t know anything about the hosts of heaven. We do know that Gabriel was the prophet Noah, but that’s about it. Yet these people had but one task – to tell the elect of God all about the glorious news of Christ’s birth and mission. So who are the angels in the Living Nativity? The Angels represent the saintly individuals who help us find Christ ourselves. They could be parents, grandparents. They could be brothers, sisters, or friends. They could be the missionaries who taught us. Whoever they are, these are the people we honor throughout our lives because they spoke the words that saved us. The wise men are somewhat enigmatic figures. There is no evidence to suggest who they were, where they came from, or how they knew to expect the birth of Christ. What we do know, though, is that they were almost certainly not Jews. We know that they came from the East. Traditionally three, and often given the names Balthasar, Gaspar, and Melchior, we only know that they traveled a long way to see Christ and arrived approximately two years after his birth. For members of the Church, the Wise Men are particularly significant. As we know, we believe that the Lord preached the coming of Christ to all the people of the world, not just to the Jews. These wise men obviously had received some sort of prophecy, waited for it, and went well out of their way to see it fulfilled. The presence of the wise men is a confirmation of what we believe, that God visited other people as well (much like the Nephites). Personally, I believe these were members of some of the lost tribes, or potentially decedents of Ishmael or one of the other sons of Abraham. However, whoever they were, they are proof of the truthfulness of the message of the Savior in both the Bible and the Book of Mormon, there are other sheep, and he will gather them! Interestingly, we see them arriving to the party about 2 years late. This means they saw the star on the birth of Christ and then, much like the shepherds, departed on their journey as soon as possible. Yet, it takes them a while to find the location. It is through no fault of their own that they find the Gospel later in life. So who are the Wise Men in the Living Nativity? The wise men represent those who recognize truth from afar and actively seek after the Lord once they know where to find him. These people were more active about their religion than most, and as such were permitted, despite great physical and cultural differences, to take part in the miracle of the Redeemer. Perhaps these represent those who do not yet have the truth simply because they know not where to find it, but once they find it they drop everything and run toward it with open arms, even at great personal sacrifice. Next, we leave the good examples and journey to King Herod. Because we want to be uplifting this season, we will not dwell on him with great detail. He was a sort of a puppet king. Technically an Edomite (from the lineage of Esau, brother of Jacob), he tried his hardest to make himself the King of the Jews. Interestingly enough, we see Herod looks to the scriptures to find where Christ will be born. We know, of course, when he is informed of the birth of Jesus, his reaction is to try to put the threat to his rule to rest. We also see that he attempts to manipulate the Wise Men to his own selfish aims. So who is Herod in our Living Nativity? Herod, obviously, represents the kingdoms, religions, and people of the world who cannot accept the coming of Christ into their lives. When faced with an opportunity, they fail to pass the test. Whether they be non-believers who reject Christ outright, or whether they be Christians who try to twist the mission of the Lord to their selfish aims, either way, Herod is not the character we want to be in the Christmas pageant of our lives. Unfortunately, he was too busy doing other things, presumably good things, to recognize the miracle that was going on literally in his backyard. We know nothing more about him other than, when faced with a chance to see the birth of the Lord, he instead went about his everyday life. So who is the Innkeeper in our Living Nativity? He represents the “Martha” in all of us. He is the person so concerned with living this life that he fails to notice its miracles. He is the man or woman who is too concerned with work, school, family, church, or community obligations that he never sees the Savior or his hand. And while all around him are overcome by the marvelous miracle of the Atonement, he fails to notice and when offered a chance, dismisses it as an annoyance. We have now covered most of the main characters of Christmas. Yet the Book of Mormon teaches that there was another group paying rapt attention to the events of the stable in Bethlehem. Turning our focus to the other side of the globe, we see the Nephites were divided into two factions. There were those who were faithfully waiting the sign, and those who were waiting to slay the believers. Yet all were eventually overcome when they saw the wonders in the heavens. So who are the Nephites in our Living Nativity? They represent the world who, while not involved in the events of Christmas directly, are nonetheless watching and waiting to see the result. These are they who see the good works of others and glorify their Father in Heaven. They represent those who, while they may never actually see Christ, are content to witness the signs he has provided and allow these to lead them to a the truth. This one is so obvious, I almost did not mention it. But Jesus Christ himself is the center of the Nativity. 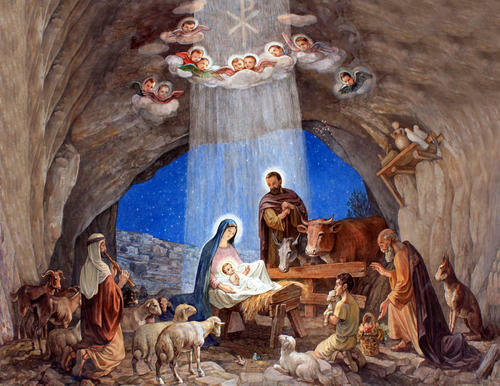 Without him, the entire Nativity is meaningless, and the story is entirely unremarkable. Similarly, Christ is the center of our faith and the center of our church. We repeat his name often, we speak and write and sing and teach of him. So who is Jesus in our Living Nativity? On a basic level, he is Jesus. But on a deeper level, he is what takes the mundane and makes it divine. He transforms the stable into a temple, and he transforms us from imperfect creatures into the Children of God. Without him, our existence has no point and would be doomed to eternal extinction. So now that I have recited the cast of Christmas characters, perhaps I will take a moment and mention why. Ultimately, Christmas and its pageantry and symbols are something we repeat, year in and year out. The point is, that we repeat the Christmas rituals each year because the true miracle of Christmas is that it recurs. Yet each year when we approach it, we do so from a different perspective. One year, we may find ourselves playing the role of Elisabeth, suffering faithfully through unknown trials. Another year, we may play the role of Mary, accepting an impossible promise on the word of revelation. We may some year find ourselves as a shepherd, rushing to see Christ and discover him, either again or for the first time. And still another year, we may find ourselves in the role of an angel, shouting our testimonies for all to hear. We have seen the drama repeated each year in the hearts of those who discover the Babe of Bethlehem and the Lord of Calvary each day. Christ can also reborn into your life each time your knees touch the floor and your heart touches heaven. This Christmas, as you picture the Nativity, as you hear the story and read the words, find who you are in the drama and allow Christ to be reborn into your lives, to touch your hearts, and to add meaning to everything you do.